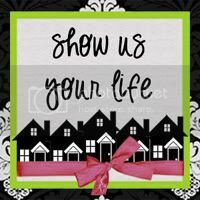 This weeks' Show Us Your Life topic is "Costumes". Here are a few family favorites from before my time. This is Mommy's all-time, most favorite, bestest costume ever! Mimi made it for her when she was a little girl. Mommy says she remembers being so excited as she watched Mimi spend days gluing cotton balls to footed jammies...and even more excited when she won the "Most Adorable" prize at her church's Fall Carnival. Mommy had big plans to make a very similar costume for me this year, but she changed her mind when people kept asking, "Won't she just try to eat the cotton balls?" Here's a more recent costume of Mommy's. The school she taught at often had "Book Character Dress-Up Day" on Halloween. Can you tell what book "character" Mommy is supposed to be? She's the coconut tree from "Chicka, Chicka, Boom, Boom"! 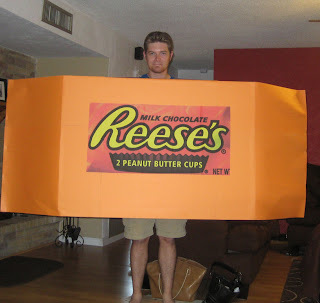 Mommy came home from teaching last Halloween to find Daddy wearing this little number: Their small groups theme for Trunk or Treat was "candy"...so daddy decided to use a TV box to make a costume of his favorite candy! I hear he was a big hit at Trunk or treat. Remember this pumpkin from a few weeks ago? As of right now, this is the only costume I've ever worn. It's not my Halloween costume, though! That one will be debuted at Trunk or Treat this weekend...so you'll have to check back here on Saturday night if you want to see it! Her hats (and that pumpkin outfit!) are adorable. Where do you get her hats? 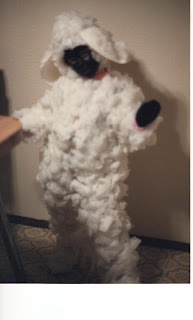 My mom made a sheep costume for me once, too, with the cotton balls and black face paint for our Noah's Ark themed church festival. I remember loving that, too! Those are so good... 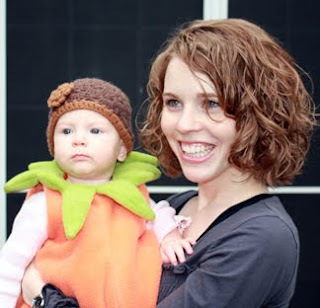 Your daughter is precious and I love the pumpkin costume! Your Katie Bug is so very cute. We have a katie bug too! Love your costumes and your blog design. Just visiting from Kelly's Korner. 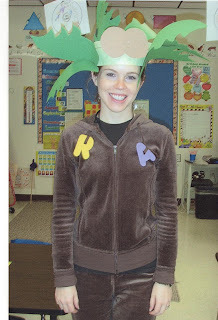 I love the Chicka Chicka Boom Boom costume. My name is Rachel Moss and this is my 9th year of teaching. I love working with first graders! My hope is that this blog will be an effective way to let my students' parents see all of the learning that is taking place in our classroom each day.